The menu color and the action button for ex are gone. 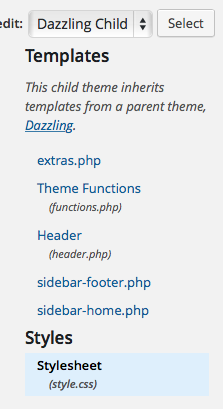 I do all the correctiones in the child theme or the theme options. And it works. Conclusion: I can’t update. What’s wrong? 2. Website in mobile: portrait correct, landscape incorrect (too wide). Do you suggest to change it or just add ”20”? I liked your suggestion and therefore use your dazzling child theme. BUT the latest theme update corrupt the child theme! As far as I can see your menu http://www.wiredmark.com/ doesn’t work the way I want a menu to work! If I click a button on the main level there’s a page behind that opens. BUT if that button on the main level has one or two sublevels it doesn’t open, there seems to be nothing behind. Is that the way a menu should work? I have the same problem and I’m looking for a solution! Is there one??? From time to time I get the following message. Is it due to dazzling or WordPress? It says: Are you shure you want to do this? Here I’m lost. When I add one tier it shows up and works BUT I can’t klick back to the 0 tier (the main page). When I add tier no 2, 3, and 4 only tier no 1 shows upp, the others aren’t visible. And it’s impossible to open tier no 0. What is the solution? Can I continue this thread as I can’t find my problem elsewhere? When adding subpages to the toplevel it’s possible to open only the subpages, not the toplevel page from the menu. One detail: The logo is somewhat near the top. I can change the code if you tell me which affect the width. Super, brilliant … I’m lucky I didn’t start that child yet as I’m just testing so far. The child theme works but I think you forgot to change third to fourth. And it puts itself in the first position above the others (see the attachment). But one mor question; I would also appreciate the possibility to adjust the width of the (text) area under the sliders and above the footer. It would be nice to make it less wide.